I’ve been kept from blogging here lately by managing various class details and two searches, among other things. Still, I wanted to post a brief update of what’s going on in the Digital History Seminar. All four groups have submitted proposals (“contracts”) with their plans for the projects and how they will complete the project. [They did this via GoogleDocs that each group had used to write the contract.] These contracts included a description of the project, an annotated list of the digital tools they were planning on using, and a timetable for the completion of the major components of the project. In most cases, the proposed projects are more ambitious than those I would have assigned had I been very precise about what I wanted. [I was intentionally broad in my initial descriptions of the projects.] Although one or two of the groups may have to ultimately scale back their goals a little bit, thinking creatively and ambitiously about these projects is exactly what I hoped for these students. They have done that. The tools they’ve chosen to use are mostly those that DTLT and I presented to them as part of their digital toolkit. [Omeka, GoogleDocs, SIMILE/Timeline, WordPress (via UMW Blogs WPMU), WindowsMovieMaker, scanning, etc. There are a few exceptions that were outside that list (e.g., Adobe Contribute for a site that’ll be part of the school’s official site), but that’s okay. The groups at least had a chance to think about which tools made the most sense, given what they wanted to do. The schedules were often very ambitious, and that was the most common comment I made to the groups. Still, in almost every case the group members wanted to forge ahead with their ambitious set of deadlines, hoping that it would keep them on track throughout the semester. Each group received my comments and has until tonight to revise their contract for my approval. [They can still make changes, but they’ll need to have a good reason to do so after this point.] Next week we’ll continue our weekly discussions of a topic related to digital history (this week’s topics are Copyright and Wikipedia) and we’ll see the first groups present status reports to the class as a whole. Not only will these weekly reports force students to articulate where they are and what they’ve been doing, they will also provide a forum for students to share their problems and successes with their classmates. Twitter: Why all the fuss? Although I have no idea what the company’s business plan is (probably to be bought by Google or Yahoo), it’s interesting to me that so many people are asking themselves how to use it (or dismissing it as overwhelming and/or naval-gazing). If we see it as a slightly different method of keeping in touch with other people, with people we’re interested in for a variety of intellectual or personal reasons, then good. Why the hand-wringing or defensiveness about it I see from so many bloggers (many of whom I really respect)? [For example] Is it that it’s really hard to explain to people who aren’t on it? A podcast by CHNM’s Digital Campus team and posts by Jerry Slezak and Jim Groom, stimulating an active conversation about the merits and weaknesses of Facebook in academic settings have prompted me to write about my own recent experiment with the social networking site. I’ve had a Facebook account and a growing number of mostly student friends (~65) for a couple of years now. I’ve used it mostly to keep in touch with recent grads, though current students have used it to look up my AIM account or converse with me about particular projects or their on-campus activities. Recently, however, I set up a Facebook group for my History Department Alumni Book club and invited those of my Facebook friends who were alums. Thirty joined in 24 hours, and other alums joined as well (I left the group open) bringing the total close to 40. I’ve already organized the next meeting and book choice via the event system and people have already RSVPed (and explained to the group why they’re not coming, if they can’t make it). Not sure why I resisted tapping into that existing community before now, but I’m glad I have. I’m not particularly interested in using it for classroom teaching at this point (though I’m open to the possibility if it made sense); rather I see Facebook as a way to engage students in larger (broader than one course) discussions and as a way of interacting with students and former students through a group channel that persists beyond their time in a particular class or in their collegiate career. I’ll post about Facebook’s relation to the book club in future posts. UPDATE: A former student contacted me via Facebook after I created the book club group. He had wanted to be in the book club when he graduated two years ago, but had forgotten to contact me to sign up. He’d seen the book club group on Facebook and he’s excited to be able to join it now. * “Unofficial” is an awkward, though brief, way to describe people who I know, but are not Facebook friends with; however, “non-friends” (an alternative I considered) makes it sound like I don’t like them…. Martha has asked over at the Fish Wrapper, what kind of bloggers we are, with the goal of complicating the notion of any one style or method or purpose of blogging. [She’s right, I do tend to think of blogging as more or less the same. This is another case of us confusing the technology with the conversation.] I’ll answer Martha’s questions for myself below. Generally, are you an impetuous blogger? Or do you mull over an idea or post for hours, days, weeks before hand? Do you draft a post and then let it sit until you’ve had a chance to revise it multiple times, perfecting your language and point? No, I’m a muller. I will let posts sit for months at a time. But, oddly, now that I think about it, not generally because I want to revise them more. I’m an impetuous drafter, writing blog posts as inspired, but I tend not to hit “Publish” on them very quickly. [Faculty Academy this year being an exception.] That has more to do with a deliberate (self)consciousness of my online presence than the care with which Barbara Ganley calls for in “slow blogging”. Do you “collect” the references in your posts before you write them (if so, describe your system)? Or do you blog with 15 windows open, copying and pasting quotes and URLs, as needed? Do you blog in the admin panel of your blog? Or do you use some third-party tool? If you use a tool, what features does it have that hooked you? The admin panel. It’s worked pretty well for me. Do you automatically consider placing images in your posts? Or does this not even occur to you, usually? I don’t usually even think of it. I’m generally blogging about concepts, but I see Barbara and others do the same, but with pictures. I’ll have to think about this idea more. Do you write posts and then delete them before clicking “Publish?” Or, by extension, do you have draft posts that have languished for days, weeks, months waiting for you to pull the trigger? Do you feel compelled to blog on a schedule? Do you feel guilty when you don’t? No, but I feel left out when I see lots of other people posting and I haven’t had time (or something to say). Do you “craft” the experience of your blog, adding sidebar widgets and custom graphics to lure readers into your space? Martha and Laura‘s posts about this view of blogging and technology suggest we really need to work harder to clarify that these tools are just that, tools, and ways of furthering conversations, creating interactions, and reading, processing, and adding to, that torrent of information to which we all have access, and with which we all have to deal. 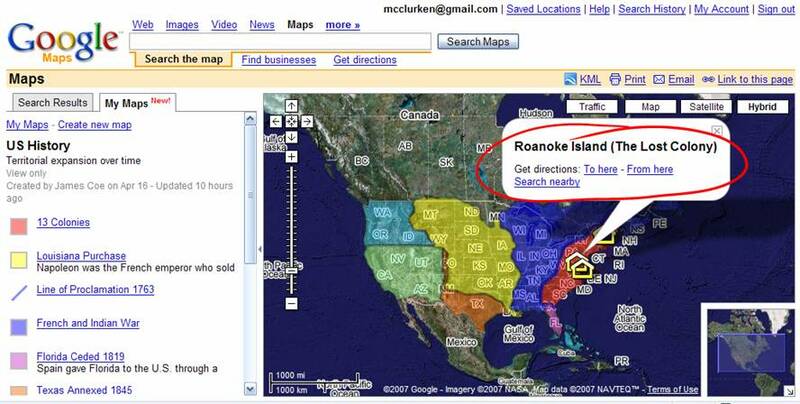 So, I’m just wondering how good Google’s directions to the Lost Colony are. I guess their search engines really can find anything….